The Ice Princess is set in a small Swedish town, Fjallbacka and is the first in a series of books featuring Erica Falck and Patrik Hedstrom. It was actually published in 2003 in the UK and I ended up reading it because it was free on iBooks (yes, I know, I’m cheap but I can’t resist a free book). I’m really glad I did, though one free book may end up costing me quite a bit as I now try and catch up with what I think are another 10 books in the series! Erica is a biographer. She has returned to her childhood home following the death of her parents and is using the excuse of clearing out their house to avoid writing her next book. Her writers block ends with the death of Alex, her childhood best friend who had moved away when they were teens and she hadn’t seen or heard from her again. 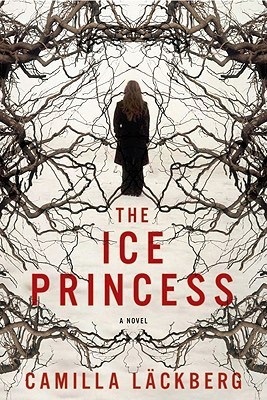 Alex is found with her wrists slit in a bath of frozen water and her death is pronounced a suicide. Erica begins writing a book based on her friends life, talking to her family and friends and bringing back a lot of memories of her own relationship with Alex. As she does, she starts to uncover secrets and find the questions she asks raise more questions. Then Alex’s death is pronounced a murder and Erica finds herself involved in the investigation…and with the detective investigating the murder, Patrick. This was a much milder books than some of the other Scandinavian crime novels I’ve read (I’m thinking mainly of Jo Nesbo here but there are others). Fjallbacka is a lot less seedy than Oslo and Alex’s is the only murder, making this what I would consider more of an old school crime novel. It wasn’t gory and the characters weren’t too damaged. I liked it for all these reasons. Plus, it is well written with a good pace and the characters are well rounded, especially for a first novel. It will be interesting to see how they progress as I begin to play catch up but, for anyone else who has missed this author, well worth a read. I’m a big fan of this series for the very reasons you mention – it is more old school and a lot of the series link past events to present crimes which I find very appealing. Great review! I just can’t believe how many I have to read! Never heard of the series. Sounds interesting. I hadn’t either. Wish I had sooner. I’ve drifted away from this stories, but I did like the early books in this series. The balance of the lives of the regular characters and different crime stories is very well done. I will be interested to see how they develop. 10 books is a lot to read in one series. I don’t often make it that far but right now I feel the need to give it a go. Series not stories – I must learn to proof-read!